This past weekend a few of us friends met up at another friend's place for a potluck dinner. I usually take dessert which gives me a chance to try something new. 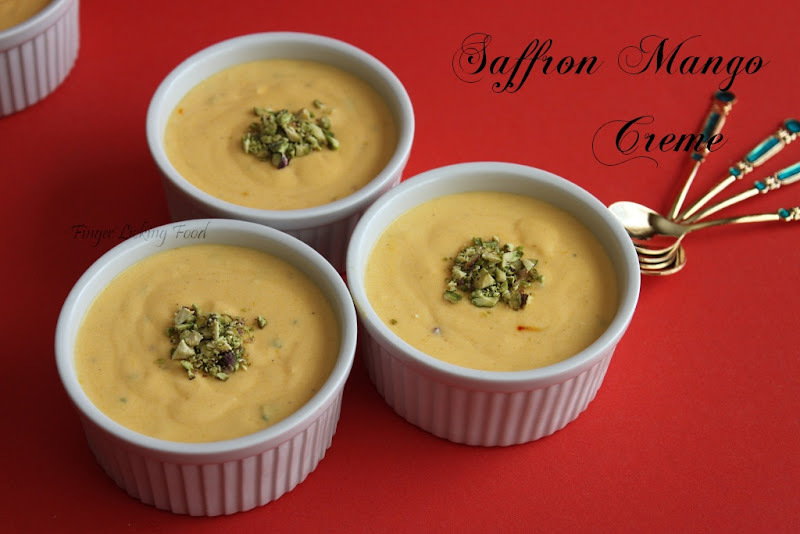 This time I made Saffron Mango creme, a creamy smooth dessert with the intense flavor of Mangoes and the ever so slight royal taste of saffron running through it. Topped off with crunchy pistachios, this one's bound to be gone in minutes. Place the bowl of a stand-up mixer or a glass bowl, and beaters in the refrigerator to chill for about an hour. Whip cream in chilled bowl on medium speed until soft peaks form. The cream should have volume but no stiffness. 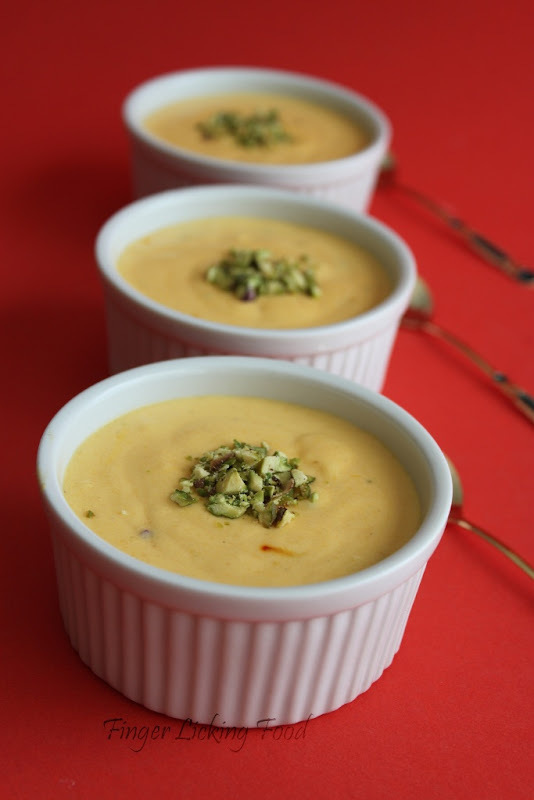 Slowly stir in the mango pulp, powdered sugar (to suit taste) saffron strands and a tablespoon of the chopped pistachios. Combine using a spatula, don’t beat. Divide the mango crème between the six ramekins and refrigerate for 4-6 hours until thoroughly chilled. 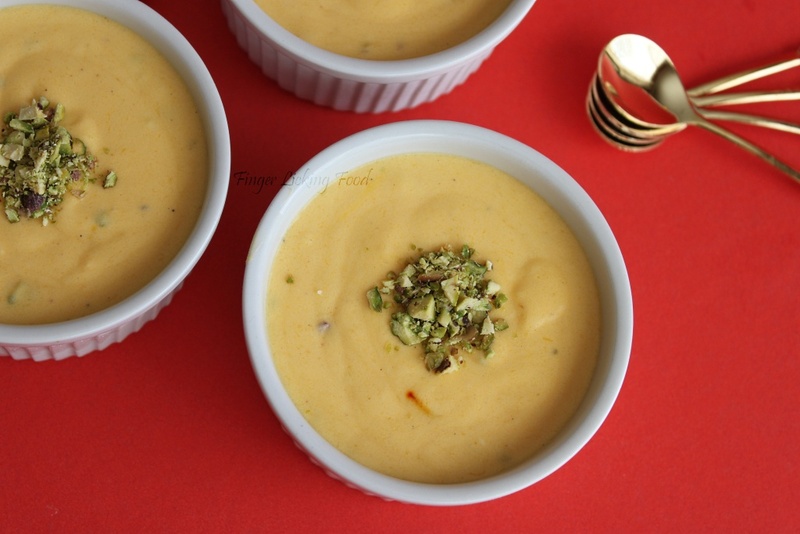 Top the crème with the remaining pistachios before serving. wow thats a great dish for the season. easy but looks splendid. am in love with your spoons. 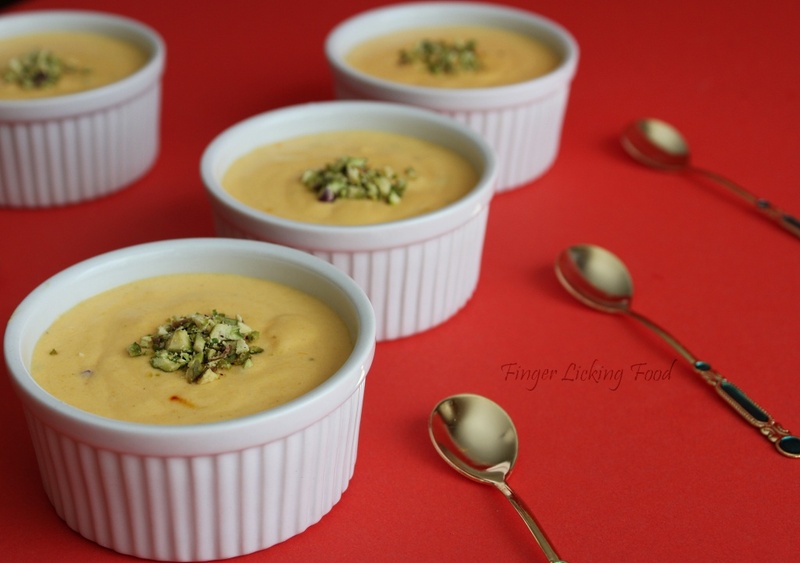 Mango n cream yum combo...want to grab a bowl :) Lovely clicks Namratha! Woww wat a beautiful cream dessert, gorgeous!! 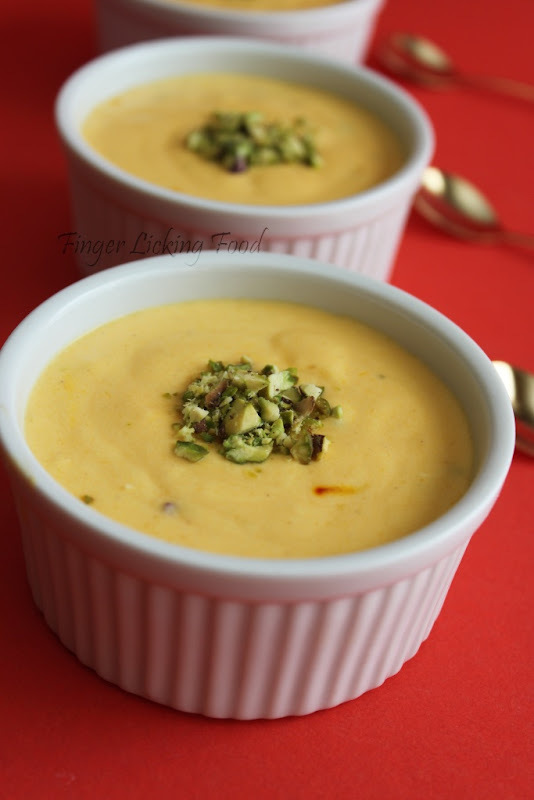 delicious.... mangoes in any form is welcome anytime..easy recipe.. love your spoons too..
looks delightful! I have some mangoes in the fridge... Im thinking of giving this a try.. But I do not have "heavy whipping cream" and have never been able to find it anywhere in B'lore. I do have Amul Fresh Cream - would that do? Btw, Is it even possible to whip cream in a mixer? I dont have an electric beater. This dessert looks and sounds amazingly rich and creamy and melt in the mouth. The title of this post makes me swoon. @Rohini, heavy whipping cream is the Amul heavy cream in India, so yes you can use the same. And I wouldn't suggest blending cream in a mixie/blender, because it will quickly turn to butter. You can use a whisk if you don't have an electric blender. It will only take longer to get the consistency you need. First time 2 ur Wonderful Blog !! Btw The mango cream is truly tempting !! Wow saffron mango combo looks awesome! I made this today and It was awesome!! Skipped the Saffron and Pistachios and added some almond powder.